Summary. Aim: Placenta-specific 1 (PLAC1) is among recently-discovered placental antigens which exerts fundamental role in placental function and development. Increasing body of literature shows that PLAC1 is frequently activated and expressed in a wide variety of human cancers and promote cancer progression. However, no data is available regarding the expression of mouse orthologue, plac1, in murine cancer cell lines. Materials and Methods: We investigated the expression of plac1 in a series of murine cell lines from different histological origins, mammary carcinoma (4T1), melanoma (B16F10), colorectal carcinoma (CT26), renal carcinoma (Renca), glioma (GL26), B-cell lymphoma (A20 and BCL1) and also two fibroblast cell lines (NIH3T3 and L929), using RT-PCR, Western blotting and flow cytometry. Results: Our data demonstrated that plac1 transcript and plac1 protein were expressed in all examined cell lines, as judged by RT-PCR and Western blot, respectively. The molecular weight of mouse plac1 was experimentally observed to be approximately 24 kD. Flow cytometric analysis showed surface expression of plac1 in aforesaid cell lines ranging from 2% to 42.5%. Conclusion: Based on the ubiquitous expression of plac1, the investigated cancer cell lines or immortalized cell lines can be used to examine the role of plac1 in the process of immortalization. Abbreviations used: anti-rhPLAC1 Ab — anti-rhPLAC1 antibody; CTAs — cancer/testis antigens; ELISA — enzyme-linked immunosorbent assay; FBS — fetal bovine serum; HPRT — hypoxanthine-guanine phosphoribosyl transferase; HRP — horse radish peroxidase; KLH — keyhole limpet hemocyanin; MW — molecular weight; OD — optical density; PBS — phosphate-buffered saline; PBS-T — PBS + 0.1% Tween 20; PI — pre-immune rabbit immunoglobulin G; PLAC1 — placenta-specific 1; rhPLAC1 — recombinant human PLAC1; RT-PCR — reverse transcription polymerase chain reaction; SDS-PAGE — sodium dodecyl sulfate polyacrylamide gel electrophoresis; TAAs — tumor-associated antigens; TSAs — tumor-specific antigens; WB — Western blot. Up to the present, scientists have been employing several strategies including surgery, radiotherapy and chemotherapy to overcome cancer. However, all aforesaid strategies are associated with undesirable damages to normal cells albeit with different degrees. During the last two decades, the efficacy and specificity of the immune system has motivated scientists to employ immunotherapy as a new approach in order to challenge with malignant cells. In this regard, discovering tumor-specific antigens (TSAs) is a milestone step in tumor-targeting strategies with the minimum side effects on normal cells. There are, at least, three types of tumor antigens including tumor-associated antigens (TAAs) , TSAs [2, 3], and cancer/testis antigens (CTAs) [4, 5]. Among these antigens, CTAs are expressed on several types of cancer cells albeit they are expressed in normal gametes and trophoblasts. In this regard, during the last decades, CTAs have been employed as appropriate candidates in cancer research and biology [5, 6]. PLAC1 which is a member of CTAs and maps to chromosome Xq26, was first introduced by Cocchia et al. in 2000 . The PLAC1 gene is located 65 kb telomeric to hypoxanthine-guanine phosphoribosyl transferase (HPRT) gene at Xq26. The mouse orthologue Plac1 maps to the equivalent region of the mouse X chromosome . Both human PLAC1 and mouse plac1 genes contain 6 exons; the last exon codes for the protein. The human and mouse PLAC1/plac1 genes have two promoters . PLAC1 promoters are differentially employed in tumor cells and placenta [8–10]. PLAC1/plac1 transcripts started from promoter one (P1) always include exons 5 and 6 and may include exons 1 or 2 or 3 but always skip exon 4; whereas transcripts originated from promoter two (P2) exclusively include exons 4, 5 and 6 . PLAC1/plac1 genes have 75% identity at the DNA level; however, PLAC1/plac1 proteins show 60% identity at the amino acid level . In spite of PLAC1 expression in placenta, there is evidence indicating PLAC1 is highly activated in many types of human cancers including breast [11–13], lung [11–14], liver [12, 14, 15], colon [12–14, 16–18], stomach [11, 19, 20], ovary [11, 21, 22], uterus [9, 10], and cervix [12, 23] and also human cancer cell lines [11, 12, 14, 15, 24]. We also recently showed using tissue microarray that PLAC1 was expressed in prostate carcinoma  and could be viewed as a suitable candidate target for immunotherapy of human prostate cancer . Up to now, no study is available regarding plac1 expression in murine cell lines. In the present study, we assessed the plac1 expression in cancer and immortalized murine cell lines at gene and protein levels by reverse transcription polymerase chain reaction (RT-PCR), Western blot (WB), and flow cytometry. Cell lines and culture conditions. 4T1, B16-F10, CT26, Renca, A20, BCL1, GL26, L929, NIH3T3 murine cell lines (all from National Cell Bank of Iran) were cultured in RPMI 1640 (Gibco, Invitrogen, CA, USA) supplemented with 10% fetal bovine serum (FBS) (Gibco), 100 U/ml penicillin, and 100 μg/ml streptomycin in a humidified incubator at 37 ˚C with 5% CO2. Production of polyclonal antibody. Polyclonal antibody production, purification, and characterization were done as described elsewhere [27, 28]. Briefly, two different types of polyclonal antibodies were produced. PLAC1 peptide (amino acid residues 117–128 shared in human and mice) was first synthetized and conjugated to keyhole limpet hemocyanin (KLH). New Zealand white rabbits were immunized with KLH-conjugated PLAC1 peptide. Freund’s complete and incomplete adjuvants were used for first and subsequent immunizations, respectively. The produced antibody was designated as anti-P117. In addition, a recombinant human PLAC1 (rhPLAC1) (amino acid residues 23-212) was produced as described elsewhere  and injected into New Zealand white rabbits. Anti-rhPLAC1 antibody (anti-rhPLAC1 Ab) were then purified from sera of immunized rabbits using rhPLAC1 coupled to a CNBr-activated Sepharose 4B column. The purity and reactivity of purified antibodies (anti-P117 and anti-rhPLAC1 Ab) were assessed by sodium dodecyl sulfate polyacrylamide gel electrophoresis (SDS-PAGE) and enzyme-linked immunosorbent assay (ELISA). Confirmation of PLAC1 specificity of anti-P117. In order to confirm PLAC1 specificity of anti-P117, several ELISA systems were designed. In one experiment, P117 peptide and rhPLAC1 protein were separately coated overnight in ELISA plates. After washing with phosphate-buffered saline (PBS)/0.1% Tween 20 for three times and blocking with 5% bovine serum albumin, wells were incubated with titrating concentrations of either anti-P117 or anti-rhPLAC1 Ab for 1 h at 37 °C. After washing as above, 1:2000 dilution of horse radish peroxidase (HRP)-labeled anti-rabbit Ig (BioRad, USA) was added to the wells and incubation was continued for further 1 h. In the second run of experiments, anti-P117 was coated followed by sequential addition rhPLAC1 (0.15–10 μg/ml for 1 h), biotin-labeled anti-rhPLAC1 Ab (house made) (5 μg/ml for 1 h) and 1:10,000 dilution of HRP-streptavidin (Invitrogen). In the next experiment, rhPLAC1 was coated in ELISA wells followed by the addition of titrating doses of either anti-P117 or P117-saturated anti-P117 (100-fold molar ratio) for 1 h and HRP-labeled anti-rabbit Ig (BioRad) as above. In all ELISA systems, signals were developed by addition of tetramethylbenzidine and the reaction was stopped by 20% (v/v) H2SO4. Optical densities were read at 450 nm by a photometer (BioTek’s Synergy™ 4). RT-PCR assessment of plac1 expression. Cells for RNA purification were harvested at 70–80% confluence. RNA was extracted from cells and mouse placenta using ambion PureLink RNA Mini Kit (Thermo Scientific, Waltham, Massachusetts, USA) according to manufacturer’s recommendations. RNA integrity was confirmed by agarose gel electrophoresis and the concentration was determined by measuring the optical density (OD) at 260 nm in a NanoDrop spectrophotometer (Thermo Scientific). 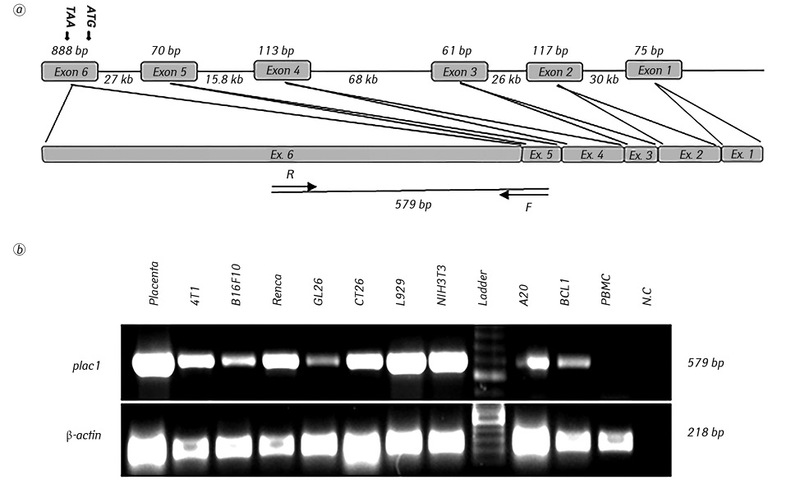 DNA contamination was removed using a commercial kit (Sigma, Missouri, USA, Product Number: AMPD1) by applying 1 μl DNase I to 3 μg extracted RNA, 1 μl 10× reaction buffer, and adequate water in a total volume of 10 μl during 20 min at RT then followed by DNase inactivation for 10 min at 70 °C. First strand cDNA was synthesized using ~3 μg (10 μl) of DNA-decontaminated RNA, 4 μl 5× reaction buffer (Fermentas, Thermo Scientific), 2 μl dNTPs (Roche, Basel, Switzerland), 1 μl N6 random hexamers (Fermentas), 1 μl reverse transcriptase (Fermentas), and 2 μl water in a total volume of 20 μl as follows: 10 min at 25 °C, 60 min at 42 °C and 10 mins at 70 °C. The synthesized cDNA was stored at –20 °C until further use. A 579 bp PCR product was amplified using plac1 sense 5´-TCAGCAGTGAGCACAAAGCCA-3´ and antisense 5´-CAAGGTGAACACGTGGTAGGAAG-3´ primers. A three-temperature touchdown PCR program was used for DNA amplification: 94 °C for 5 min; 19 cycles at 98 °C for 10 s, 65 °C for 30 s (with temperature decreasing from 65 °C to 56 °C by 0.5 °C per cycle), 72 °C for 45 s; followed by additional 26 cycles at 98 °C for 10 s, 56 °C for 30 s, 72 °C for 45 s; and a final extension at 72 °C for 5 min, using a Mastercycler Gradient Eppendorf thermocycler. PCR reactions were performed in a 20 μl volume containing 2 µl cDNA, 0.25 µl (10 pmoles/µl) of each primer, 7.5 µl water, and 10 µl Taq DNA Polymerase Master Mix RED (Ampliqon, Danmark). Mouse β-actin was amplified as control. A 218 bp β-actin PCR product was amplified using sense 5´-GTCGAGTCGCGTCCACC-3´ and antisense 5´-CATTCCCACCATCACACCCTG-3´ primers. The PCR amplification was carried out under the following condition: initial denaturation at 94 °C for 5 min, a 25-cycle amplification (98 °C for 10 s, 60 °C for 20 s, and 72 °C for 25 s), and a final extension for 5 min at 72 °C. PCR reactions was performed in a 20 μl volume containing 2 µl cDNA, 0.25 µl (10 pmoles/µl) of each primer, 7.5 µl water, and 10 µl Taq DNA Polymerase Master Mix RED. PCR products (expected product size 579 bp for plac1 and 218 bp for β-actin) were evaluated by 1% agarose gel electrophoresis. Gene expression analysis was repeated at least three times for all cell lines. Protein lysate preparation. Balb/C mouse placenta at gestational day 10 was dissected and immersed into liquid nitrogen for 20 min. Then, the frozen tissue was homogenized at 12,000 rpm for 1 min in a homogenizer (Sartorius Mikro-Dismembrator). The tissue was lysed in tris-triton buffer containing 10 mM Tris-HCl, pH 7.4, 100 mM NaCl, 1 mM EDTA, 1 mM EGTA, 1% Triton X-100, 10% glycerol, 0.5% sodium deoxycholate, 0.1% SDS, and 1% protease inhibitor cocktail (Sigma P8340). The lysate protein concentration was measured by a BCA protein assay kit (Thermo Scientific) and stored at –80 °C until further use. Human placenta, immediately after Cesarean section, was used for lysis preparation as well. An eighty milligram sample from villi portion was dissected and prepared in 1 ml sample buffer containing 150 mM Tris pH 6.8, 1.2% SDS, 200 mM DTT, 33% glycerol, and 0.2% bromophenol blue. The tissue was sonicated and boiled for 15 min and then centrifuged at 17,700 g for 20 min at 4 °C. The supernatant was stored at –80 °C until further use. Cells were harvested at 70–80% confluence with saline sodium citrate buffer pH 8.0 (15 mM sodium citrate and 130 mM potassium chloride) and washed three times with cold PBS. 5•106 cells were lysed in 500 µl tris-triton buffer with the same composition as stated above. After 30 min incubation on ice, samples were cleared by centrifugation and supernatant was collected and stored at –80 °C. WB analysis of plac1 expression. rhPLAC1 (10 ng and 40 ng), a panel of cell lines (20 µl each), mouse placenta (20 µg), and human placenta (10 µl) were run on a 15% SDS-PAGE gel at 100 V for 2 h and then transferred to PVDF membrane at 200 mA for one h. The presence of protein bands was confirmed by Ponceau S staining. The membrane was blocked with PBS + 0.1% Tween 20 (PBS-T) containing 5% non-fat milk solution overnight without shaking at 4 °C. All immunoprobings were performed in PBS-T supplemented with 1% non-fat milk. The membrane was incubated with affinity purified anti-rhPLAC1 Ab and pre-immune rabbit immunoglobulin G (PI) as a negative primary antibody control both at 1 µg/ml for 1.5 h with shaking at RT. After extensive washing, the membrane was incubated with goat anti-rabbit IgG-HRP (1:5000) (Bio-Rad, Hercules, California, USA) for one h with shaking at RT followed by extensive washing and developing with Immobilon Western Chemiluminescent HRP Substrate detection system (Merckmillipore). Anti-β-actin (clone: D6A8) rabbit monoclonal antibody (Cell Signaling Technology, Danvers, Massachusetts, USA) was used for visualization of β-actin after re-probing of the membrane. Expression level of plac1 in all cell lines was tested at least three times. Expression of plac1 in each cell line was normalized against β-actin and expressed as expression ratio. Flow cytometric assessment of plac1 localization. Cells were harvested at 70–80% confluence with saline sodium citrate buffer and washed three times with cold PBS. 5•105 cells were incubated with 5% sheep serum for 30 min on ice. All immunostainings were performed in PBS supplemented with 2% FBS on ice. Cells were subsequently incubated with either PLAC1 peptide (amino acid 117-128)-immunized rabbit serum (1:100) or a pre-immune rabbit serum with the same dilution for 45 min. After three times washing, cells were then incubated with sheep F(ab’)2 anti-rabbit polyclonal antibody-FITC (1:100; Sina Biotech, Tehran, Iran) for 30 min in the dark. Cells were then washed three times followed by flow cytometry analysis using a flow-cytometer (Partec, Munster, Germany). Statistical analysis. Descriptive statistics were carried out. Production of polyclonal antibodies. In order to investigate plac1 protein expression in a panel of murine cell lines by Western blotting and flow cytometry, polyclonal antibodies directed against rhPLAC1 or P117 peptide were produced. Due to the fact that the human and mouse PLAC1/plac1 proteins have 60% identity , we expected that anti-rhPLAC1 antibody could recognize mouse plac1, too. Based on this rationale, rhPLAC1 with a molecular weight (MW) of 24 kD was used for immunization of rabbits. Also, proper conjugation of the P117 peptide with carrier protein was investigated and confirmed by SDS-PAGE (data not shown). Titer of purified anti-PLAC1 antibodies was then measured by indirect ELISA showing proper immunization and high titers of anti-PLAC1 antibodies in rabbits immunized with either KLH-conjugated peptide or rhPLAC1 (Fig. 1, a). To confirm PLAC1-specificity of anti-P117, a sandwich ELISA was designed in which rhPLAC1 was first captured by anti-P117 and detected by anti-rhPLAC1 Ab. The results showed that the values of optical densities increased with increasing concentration of rhPLAC1 denoting reactivity of anti-P117 with rhPLAC1 (Fig. 1, b). To further confirm PLAC1-specificity of anti-P117, an inhibition ELISA was performed. The results clearly showed that P117 peptide was able to considerably inhibit the reactivity of anti-P117 with rhPLAC1 further confirming PLAC1 specificity of the polyclonal antibodies directed against amino acids 117-129 (Fig. 1, c). Plac1 gene expression in murine cell lines. Here we repot for the first time the plac1 expression profile in a panel of nine murine cell lines using RT-PCR. These cell lines were from different origins including mammary carcinoma (4T1), melanoma (B16F10), colorectal carcinoma (CT26), renal carcinoma (Renca), fibroblast cell lines (NIH3T3 and L929), glioma cell line (GL26), and B-cell lymphoma cell lines (A20 and BCL1). Mouse plac1 contains 6 exons, the last one codes for the protein and exists in four known plac1 transcripts . We designed optimal primers covering exons 5 and 6 junction to amplify the four known plac1 mRNA transcripts (Fig. 2, a). These exon-exon junction primers exclusively guaranteed the amplification of plac1 transcripts regardless of probable genomic DNA contamination in PCR. The specificity of primers was validated by sequencing of PCR products of mouse placenta, 4T1, B16-F10, and CT26 cell lines (data not shown). 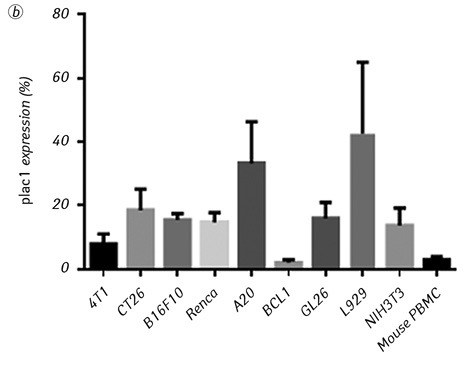 Interestingly, we observed that all examined murine cell lines showed plac1 gene expression (Fig. 2, b). In this experiment, mouse placenta and mouse peripheral blood mononuclear cells (PBMC) were used as positive and negative controls, respectively. Mouse β-actin gene was used as a housekeeping internal control gene. Analysis of plac1 protein expression by WB. After approval of plac1 gene expression by RT-PCR in the examined cell lines, plac1 protein expression was then surveyed using WB. Our results showed that despite excellent reactivity of anti-P117 with native protein, this antibody was not able to detect PLAC1 in WB. In this context, anti-rhPLAC1 Ab was used for this experiment. Since there is 60% similarity between human PLAC1 and mouse plac1 at the protein level , we expected that anti-rhPLAC1 Ab could recognize mouse plac1, too. The reactivity of this antibody to PLAC1 in human placenta as well as rhPLAC1 was initially confirmed in WB (Fig. 3, a). In negative control lanes in which anti-rhPLAC1 antibody was substituted with equivalent concentration of rabbit normal immunoglobulin, no specific band was observed. For detection of mouse plac1 protein in mouse cell lines, we further assessed the reactivity of anti-rhPLAC1 Ab against plac1 in mouse placenta lysate as well (Fig. 3, a). Data revealed that this antibody was able to recognize plac1 in mouse placenta. Again control wells showed no specific reactivity. Both PLAC1 and plac1 were detected as a sharp band of approximately 24 kD in human and mouse placenta lysates, respectively. Although the MW of mouse plac1 is theoretically predicted to be 19.6 kD, the MW of plac1 protein was experimentally shown to be approximately 24 kD. After confirming the reactivity of anti-rhPLAC1 Ab with its cognate ligand, the expression of plac1 protein was investigated in all examined murine cell lines. Interestingly, in all cell lines a band of approximately 24 kD corresponding to the Plac1 protein was detected with anti-rhPLAC1 antibody (Fig. 3, b). Notably, the expression ratio of plac1 varied between cell lines from histologically different origins. In brief, A20 and 4T1 showed the highest expression ratio, while the expression ratio was comparatively lower in CT26 and BCL1 (Fig. 3, c). Flow cytometric analysis of plac1 expression in murine cell lines. Previous studies showed localization of human PLAC1 on cell surface [11, 30]. The N-terminal side of the protein is cytosolic while the C-terminal region is extracellular. We thus hypothesized that, like human PLAC1, mouse plac1 might also be a membranous protein. Hence, plac1 localization was investigated using flow cytometry. In this experiment, the anti-P117 recognizing the extracellular C-terminal part of the plac1 was used for plac1 localization in nine examined murine cell lines. Cell harvesting was done with citrate buffer, not with trypsinization, to protect the plac1 protein from enzymatic degradation. Accordingly, it was observed that all murine cell lines expressed plac1 on the cell surface albeit with different expression levels (Fig. 4). A20 and L929 showed relatively higher surface expression of plac1 than the other cell lines. Disagreement of the results of two protein readout systems in case of some cell lines points to differential localization of plac1. There is no consensus on MW of human PLAC1 with reports ranging from 24 to 30 kD [11, 16, 24, 30]. In the present study using anti-rhPLAC1 Ab, we observed the MW of about 24 kD in human placenta. The inconsistent results on PLAC1 MW as reported in different studies may be attributed to the technical issues and also to different pattern of post transcriptional modifications in different cells. PLAC1 is predicted to have four putative O-glycosylation sites and five potential phosphorylation sites . In this context, more precise techniques such as mass spectroscopy should be employed to determine the exact MW of intact purified PLAC1 molecule. In addition, different localization of PLAC1, as reported by many investigators [15, 16, 18, 20, 24, 32], may point to the existence of different isoforms with different MW generated by alternative splicing. In line with this notion, we observed in WB a band with lower MW in human and mouse placenta. The MW of mouse plac1 is theoretically predicted to be 19.6 kD. According to the data provided in ExPASy (NetOGlyc 4.0 and NetPhos 3.1 servers), five potential O-glycosylation and at least eight serine, threonine or tyrosine phosphorylation sites exist in plac1 molecule which may account for higher MW of plac1 reported here. There is growing body of evidence showing involvement of PLAC1 in promoting vital parameters of tumors including cell proliferation, resistance to apoptosis, acceleration of cell cycle, progression of epithelial-mesenchymal transition and induction of cell migration and invasion [11, 15]. In this regard, blocking of PLAC1 protein or silencing of its transcript was reported [11, 15] to reverse cancer promoting function of PLAC1 and may be considered as a modality to control cancer. Based on this information, it can be inferred that mouse orthologue may have the same function in tumorigenesis of mouse cancer cell lines. In this regard, our data establishes a platform for future studies aiming at potential role of plac1 in cancer development in syngeneic mouse cancer models. This work was partially supported by grant from Tehran University of Medical Sciences (Grant No: 94-01-57-27939) and Avicenna Research Institute (Grant No: 960511-036). Hanahan D, Weinberg Robert A. Hallmarks of cancer: the next generation. Cell 2011; 144: 646–74. Ward JP, Gubin MM, Schreiber RD. The role of neoantigens in naturally occurring and therapeutically induced immune responses to cancer. Adv Immunol 2016; 130: 25–74. Gubin MM, Artyomov MN, Mardis ER, et al. Tumor neoantigens: building a framework for personalized cancer immunotherapy. J Clin Invest 2015; 125: 3413–21. Coulie PG, Van den Eynde BJ, van der Bruggen P, et al. Tumour antigens recognized by T lymphocytes: at the core of cancer immunotherapy. Nat Rev Cancer 2014; 14: 135–46. Simpson AJ, Caballero OL, Jungbluth A, et al. Cancer/testis antigens, gametogenesis and cancer. Nat Rev Cancer 2005; 5: 615–25. Salmaninejad A, Zamani MR, Pourvahedi M, et al. Cancer/testis antigens: expression, regulation, tumor invasion, and use in immunotherapy of cancers. Immunol Invest 2016; 45: 619–40. Cocchia M, Huber R, Pantano S, et al. PLAC1, an Xq26 gene with placenta-specific expression. Genomics 2000; 68: 305–12. Chen Y, Moradin A, Schlessinger D, et al. RXRalpha and LXR activate two promoters in placenta- and tumor-specific expression of PLAC1. Placenta 2011; 32: 877–84. Devor EJ, Leslie KK. The oncoplacental gene placenta-specific protein 1 is highly expressed in endometrial tumors and cell lines. Obstet Gynecol Int 2013; 2013: 807849. Devor EJ, Reyes HD, Santillan DA, et al. Placenta-specific protein 1: a potential key to many oncofetal-placental OB/GYN research questions. Obstet Gynecol Int 2014; 2014: 678984. Koslowski M, Sahin U, Mitnacht-Kraus R, et al. A placenta-specific gene ectopically activated in many human cancers is essentially involved in malignant cell processes. Cancer Res 2007; 67: 9528–34. Silva WA Jr, Gnjatic S, Ritter E, et al. PLAC1, a trophoblast-specific cell surface protein, is expressed in a range of human tumors and elicits spontaneous antibody responses. Cancer Immun 2007; 7: 18. Wang X, Baddoo MC, Yin Q. The placental specific gene, PLAC1, is induced by the Epstein-Barr virus and is expressed in human tumor cells. Virol J 2014; 11: 107. Dong XY, Peng JR, Ye YJ, et al. Plac1 is a tumor-specific antigen capable of eliciting spontaneous antibody responses in human cancer patients. Int J Cancer 2008; 122: 2038–43. Wu Y, Lin X, Di X, et al. Oncogenic function of Plac1 on the proliferation and metastasis in hepatocellular carcinoma cells. Oncol Rep 2017; 37: 465–73. Liu FF, Dong XY, Pang XW, et al. The specific immune response to tumor antigen CP1 and its correlation with improved survival in colon cancer patients. Gastroenterology 2008; 134: 998–1006. Shantha Kumara HM, Grieco MJ, Caballero OL, et al. MAGE-A3 is highly expressed in a subset of colorectal cancer patients. Cancer Immun 2012; 12: 16. Liu F, Zhang H, Shen D, et al. Identification of two new HLA-A*0201-restricted cytotoxic T lymphocyte epitopes from colorectal carcinoma-associated antigen PLAC1/CP1. J Gastroenterol 2013; 49: 419–26. Chen J, Pang XW, Liu FF, et al. PLAC1/CP1 gene expression and autologous humoral immunity in gastric cancer patients. Beijing Da Xue Xue Bao 2006; 38: 124–7 (in Chinese). Liu F, Shen D, Kang X, et al. New tumour antigen PLAC1/CP1, a potentially useful prognostic marker and immunotherapy target for gastric adenocarcinoma. J Clin Pathol 2015; 68: 913–6. Tchabo NE, Mhawech-Fauceglia P, Caballero OL, et al. Expression and serum immunoreactivity of developmentally restricted differentiation antigens in epithelial ovarian cancer. Cancer Immun 2009; 9: 6. Devor EJ, Gonzalez-Bosquet J, Warrier A, et al. p53 mutation status is a primary determinant of placenta-specific protein 1 expression in serous ovarian cancers. Int J Oncol 2017; 50: 1721–8. Devor EJ, Reyes HD, Gonzalez-Bosquet J, et al. Placenta-specific protein 1 expression in human papillomavirus 16/18-positive cervical cancers Is associated with tumor histology. Int J Gynecol Cancer 2017; 27: 784–90. Ghods R, Ghahremani MH, Darzi M, et al. Immunohistochemical characterization of novel murine monoclonal antibodies against human placenta-specific 1. Biotechnol Appl Biochem 2014; 61: 363–9. Ghods R, Ghahremani MH, Madjd Z, et al. High placenta-specific 1/low prostate-specific antigen expression pattern in high-grade prostate adenocarcinoma. Cancer Immunol Immunother 2014; 63: 1319–27. Nejadmoghaddam MR, Zarnani AH, Ghahremanzadeh R, et al. Placenta-specific1 (PLAC1) is a potential target for antibody-drug conjugate-based prostate cancer immunotherapy. Sci Rep 2017; 7: 13373. Akhavan A, Ghods R, Jeddi-Tehrani M, et al. Production and purification of anti-rhombomys opimus immunoglobulins. Iran J Arthropod Borne Dis 2011; 5: 69–76. Amini N, Vishteh MN, Zarei O, et al. Production and characterization of polyclonal antibody against a synthetic peptide from beta-actin protein. Iran J Basic Med Sci 2014; 17: 396–400. Nazari M, Zarnani AH, Ghods R, et al. Optimized protocol for soluble prokaryotic expression, purification and structural analysis of human placenta specific-1 (PLAC1). Protein Expr Purif 2017; 133: 139–51. Fant M, Barerra-Saldana H, Dubinsky W, et al. PLAC1 protein localizes to membranous compartments in the apical region of the syncytiotrophoblast. Mol Reprod Dev 2007; 74: 922–9. Massabbal E, Parveen S, Weisoly DL, et al. PLAC1 expression increases during trophoblast differentiation: evidence for regulatory interactions with the fibroblast growth factor-7 (FGF-7) axis. Mol Reprod Dev 2005; 71: 299–304. Yin Y, Zhu X, Huang S, et al. Expression and clinical significance of placenta-specific 1 in pancreatic ductal adenocarcinoma. Tumour Biol 2017; 39: 1010428317699131.